Windows users also searching about; why windows 10 stuck in the restart loop? How do I fix Windows restart loop? How do I stop a boot loop? Why is my laptop stuck on restarting? How do you fix a computer that keeps restarting? Whereas, some users finding the solutions that their machine stuck into an endless reboot loop after upgrading to the latest Windows 10. 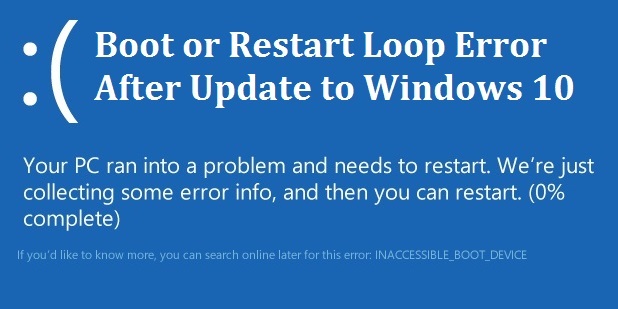 And if you are also searching for the quick way to Fix & solve endless reboot loop after Windows 10 Update, how to fix Windows 10 constant reboot loop difficulties? Then you are on the right page. Learn how to get out of this error. Microsoft has recently released a patch to troubleshoot blue screen errors to fix endless reboot loop after Windows 10 update. Here you get to fix the reboot bug by reinstalling the update after deleting update keys. If possible, booting into the safe mode is the most suitable way to solve this problem. However, the Windows installation and the things related to booting OS need to be concerned. This guide will help you out and solve the endless rebooting problem on Windows 10. You must follow these steps within any other versions of Windows 10 OS if you find continues rebooting error on any of them. Solve windows 10 start-up problems in easy steps - black/blue screen, boot-loop, infinite loading which are one of the irritating Window bugs for cumulative update installation issues. Previously you have seen the error CD/DVD ROM Access Denied - Permission [SOLVED], but today we are going to see totally new and vital Windows installer problems occured while updateing to new Operating System Windows 10. Start windows in safe mode. [While booting press SHIFT+F8]. a. Note that you can also use the Shift + Restart combination from the 'Sign In' screen. b. Then, Windows 10 will reboot and ask you to select an option. Choose 'Troubleshoot'. Select 'Advanced options'. c. On the Advanced options screen, choose 'Startup Settings'. Press 'Restart'. d. To enable 'Safe Mode with Networking' press F5. Now once you started windows in 'Safe Mode with Networking', you need to open 'Device Manager'. here you need to remove Graphics drivers. System Firmware driver, networking driver. Once you removed, RESTART your PC. You are now out of that error. Reason: You drivers are not compatible for new updates. You need to update those from official sites with keeping an eye for compatibility to latest windows 10. Don't update drivers if those are not compatible to Windows 10. Let me know what you get by these steps. After troubleshooting issues, the Windows problem reporting service from Microsoft released a new patch to fix this Window bugs just by downloading the new working update. You need to go "Setting" >> Update & Security >> Windows Update and click on "Check for updates". This will trigger to download new patch and install to fix endless restart loop error.